Let's face it, opossums aren't pretty. They have up to 50 needle-like teeth and ooze offensive fluids from both ends of their body. But like most of the creatures we've profiled here, they learn fast. These nocturnal marsupials are common east of the Rockies and along the West coast. They like forested areas with streams or swamps nearby, although like raccoons, they are increasingly found in urban areas. Opossums' favored food is road kill (which they often become because of their nighttime activity), but they'll also partake of fruits and vegetables, especially tomatoes and corn. And like raccoons, opossums rummage through trash cans. If you see a mauled tomato or corn plant with fruit missing, opossums may be your culprit. To discourage opossums from visiting your yard, stow water and food supplies, such as pet bowls and bird feeders, out of reach at night. 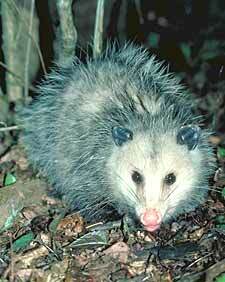 Opossums also can be deterred with repellents, scare tactics, and a good fence. Moderately successful homemade repellents include a dusting of baby powder, cayenne pepper, or blood meal on vegetables and corn ears. In a small garden, cover individual corn ears or melons with bags taped shut. Place baffles on the trunks of fruit trees to prevent opossums from climbing them. Prune overhanging limbs that opossums might use to launch themselves into the fruit tree. To prevent lawn damage, control grubs and other insects. You can scare opossums temporarily with loud, intermittent noises or lights, but the racket generated by motion-sensor noisemakers or lights may prevent you from getting much sleep at night! The best deterrent is a good fence. Opossums are agile and smart, so build your fence well. If all else fails, remove persistent marauders with a trap.